The Capital One SavorOne Cash Back rewards credit card is a no annual fee card and will help you earn cash back rewards on everyday activities. It offers generous cash back for entertainment expenses and eating out at fast food or restaurants as well as a better than average cashback rate for groceries. Enjoy the generous 15-month 0% on balance transfers and APR to help you pay down an existing balance you may have or pay off new purchases slowly, as well as a $150 sign up bonus. However, this card has higher than average APR and 3% balance transfer fee. Receive a $150 sign up bonus once you spend $500 or more in your first 3 months of opening your account. This bonus can be redeemed as cash back, statement credit, gift cards, and other reward options Capital One offers. If you don’t decide to eat out one night, don’t worry! The Capital One SavorOne card is offering 2% cash back on groceries so you can stay in and enjoy eating at home knowing you’re earning double the reward points of most credit cards. Additionally, you get 1% cash back on all other purchases. If you want to use the Capital One SavorOne card only for dining and entertainment, and use another credit card for another spending, you can. There is no annual fee so don’t stress about times you’re not using the credit card. One feature you’ll enjoy about the Capital One SavorOne card is there are no rotating rewards categories. Every month you earn the same 3% back on dining out and entertainment and you earn the same 2% on groceries. There also is no maximum reward amount you can earn each quarter so if you happen to spend a lot, you’ll get all those reward points, no caps. While you do get access to the 0% APR introductory rate for 15-months on balance transfers, it comes at a cost of a 3% transfer fee. This can add up if you have a large balance you are transferring over. With the Capital One SavorOne card, expect to pay a higher than average APR even with good credit. The advertised range is 15.24% – 25.24% so depending on your credit you may fall higher or lower on the rate range. If you already have Capital One credit cards or you plan on getting multiple different cards from them then this drawback applies to you. You’re only allowed two credit cards at a time from Capital One so getting approved for a third could be challenging. They also like to see at least 6 months between opening a new Capital One card from the previous so keep this in mind if you’re trying to open multiple Capital One cards within a short time frame. Let’s also review some other high cash back rewards credit cards so you can make a comparison to determine if the Capital One SavorOne card is for you or not. The Chase Freedom credit card is a great option if you’re looking for a high rewards card that offers 5% cash back. However, you’ll only earn the 5% rate on specific spending categories and they rotate every 3 months, so you must keep up with them and activate them manually every 3 months to be eligible. If you forget to activate the rewards you won’t earn the 5% rate. The Chase Freedom has no annual fee and offers a $150 sign up bonus upon spending at least $500 in the first three months. It also offers a 15-month introductory period at 0% APR on purchases and balance transfers. One of the best cash back rewards credit cards is the Citi Double Cash. It offers a flat 2% rewards rate on all purchases which makes it simple on you not having to track specific spending categories each month and remembering to activate rewards. While other cards offer higher rates on certain categories like food, gas, and entertainment, the Citi Double Cash makes up for it by giving you 2% on all other categories that normally would only earn 1% with other cards. To earn the 2% cash back you must pay off the purchase. You earn 1% upfront when you spend the money and you earn the other 1% when you pay it off. 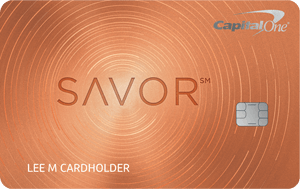 The alternative Capital One credit card is the Savor card, which offers an increased 4% cash back rate on dining and entertainment as compared to the SavorOne card. However, the extra 1% rewards come at a cost of $95 per year for the annual fee this credit card charges. For it to make sense, you’d have to spend more than $9,500 per year on dining and entertainment to justify earning the extra 1%. Is the Capital One SavorOne Rewards Card Right for You? If you enjoy the nightlife and getting out to have some fun, then this could be a great credit card option for you. Earning high cash back rewards on dining out and entertainment with no annual fee can be a great way to put extra money back into your pocket doing things you already enjoy doing each week. It also offers the generous 15-month 0% APR period to help you pay down an existing balance you may have or pay off new purchases slowly, interest-free.